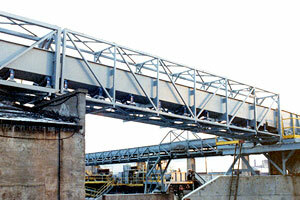 Each conveyor is custom engineered and manufactured to suit your application. TS will engineer, detail and certify truss conveyor drawings to meet standards. 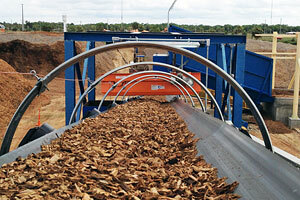 Available in trough, flat slider, and tube conveyor designs. Adjustable skirting to ensure smooth transition of materials & prolong belt life. Impact sections are custom engineered to suit your applications. Optional hoods keep elements out of materials, while keeping dust in. Available in heavy duty and medium duty designs. Each conveyor is built with a TS designed, positive action, eccentric drive, that minimizes the effect of load variations. TS Manufacturing also incorporates a special shock absorbing wrist pin, which substantially prolongs the life of the drive train bearings. TS Vibrating Conveyors are engineered and balanced to reduce the requirements of foundations and substructures. 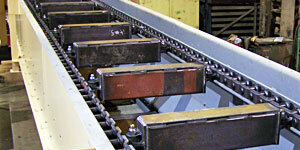 TS Chain Conveyors are a good choice for handling bulk materials that require slightly gentler manipulation. The chains are custom sized and engineered for maximum efficiency with the material being handled - also guaranteeing a longer life for the conveyor. TS Manufacturing has designed and manufactured a variety of gallery conveying systems. With installations ranging from 40' to 3000', TS Manufacturing has the capacity to handle even the largest of conveying requirements. TS Manufactures and supplies high or low pressure systems. Complete or partial systems can be designed and/or manufactured including Feeders, Blowers, Pipe, Elbows, Cyclones, Valves and Controls. TS Manufacturing utilizes the latest in Computer Assisted Design software, operated by experienced engineering staff, to ensure every piece of equipment exceeds expectations. 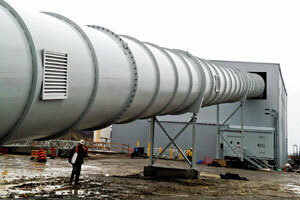 Our Project Managers oversee projects ranging from equipment consulting to the entire lifecycle of complete projects.